Pressing herbs is a creative way to preserve their beauty year-round – here is a project I created for the Herb Society magazine, published in their December 2015 issue. Why not press decorative herb leaves and flowers as you spot them around the garden, by inserting between blotting paper inside a heavy book such as a telephone directory. 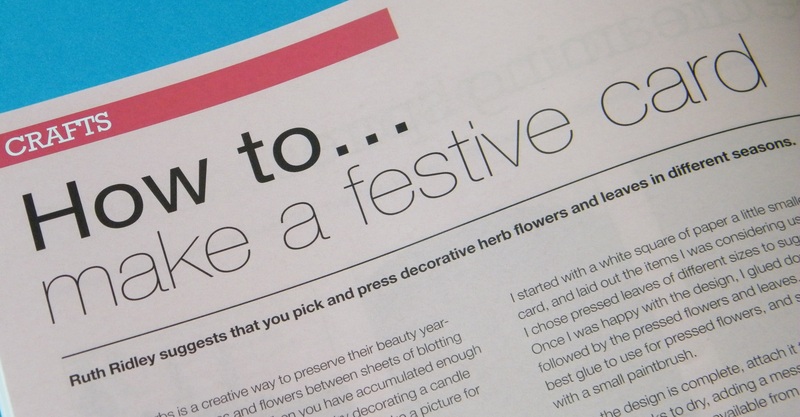 When you have accumulated enough pressed flowers for a project, why not try decorating a candle (see Herbs magazine December 2014 for this project); make a picture for the wall, or try making a pressed flower Christmas card. For this winter scene, I chose an astrantia flower as a wintery sun (the flower was initially pale pink, and faded on drying to a pretty combination of cream and green), with sage and artemisia leaves as trees. Astrantia and artemisia both have traditional uses. Astrantia, also known as masterwort, was used in aiding digestion, and artemisia (wormwood) was used, as the name suggests, for parasitic infestations. Sage is interestingly currently undergoing scientific trials for improving cognitive skills. I chose a dark cream card to offset the colour of the astrantia, with a white paper sky and dark green grass. The paper I used for the grass has a delicate silver pattern on it to reflect the natural wintery shades of the trees. I started with a white square of paper a little smaller than the chosen card, and laid out the items I was considering using. For the trees, I chose pressed leaves of different sizes to suggest perspective. Once I was happy with the design, I glued down the green paper followed by the pressed flowers and leaves. Inexpensive PVA is the best glue to use for pressed flowers, and should be applied sparingly with a small paintbrush. Once the design for your DIY Christmas card is complete, attach it to the card and press flat between books to dry, adding a message if you wish. Pre-printed messages are readily available from craft shops, or it’s easy to print your own these days. Other herbs which may be useful for a pressed flower Christmas card: rosemary resembles pine needles for a Christmas tree; use salvia flowers for Angel’s trumpets or doves; parsley, thyme, verbena and ginkgo for more trees and shrubs, or borage for stars. Tip: Use tweezers if you find it tricky to position the small components.